Coriander Coriandrum sativum, also known as cilantro or Chinese parsley, is an annual herb in the family Apiaceae. All parts of the plant are edible, but the fresh leaves and the dried seeds are the parts most traditionally used in cooking. Coriander is native to regions spanning from southern Europe and northern Africa to southwestern Asia. It is a soft plant growing to 50 cm (20 in) tall. The leaves are variable in shape, broad at the base of the plant, and slender and feathery higher on the flowering stems. In English in the late 14th century, the word "coriander" derived from the bed bug, and was given on account of its horrible, bed bug-like smell. The earliest attested form of the word is the language of the Mycenaean Greeks. Cilantro is the Spanish word for coriander. It is the common term in North American English for coriander leaves, due to their extensive use in Mexican cuisine. Coriander grows wild over a wide area of Western Asia and southern Europe. About half a litre (a pint) of coriander was recovered from the tomb of Tutankhamen, and because this plant does not grow wild in Egypt, it was interpreted this find as proof that coriander was cultivated by the ancient Egyptians. Coriander seems to have been cultivated in Greece since at least the second millennium BC. Tablets recovered from Pylos refers to the species as being cultivated for the manufacture of perfumes, it apparently was used in two forms: as a spice for its seeds and as a herb for the flavour of its leaves. This appears to be confirmed by archaeological evidence from the same period. 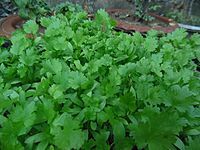 The leaves are variously referred to as coriander leaves, fresh coriander, dhania, Chinese parsley, or (in the US and commercially in Canada) cilantro. The leaves have a different taste from the seeds, with citrus overtones. Some people may be genetically predisposed to find the leaves to have unpleasant soapy taste or a rank smell. The fresh leaves are an ingredient in many South Asian foods (such as rasams, chutneys, and salads); in Chinese and Thai dishes; in Mexican cooking, particularly in salsa and guacamole and as a garnish; and in salads in Russia and other CIS countries. In Portugal, chopped coriander is used in the bread soup Açorda, and in India, chopped coriander is a garnish on Indian dishes such as dal. As heat diminishes their flavour, coriander leaves are often used raw or added to the dish immediately before serving. In Indian and Central Asian recipes, coriander leaves are used in large amounts and cooked until the flavour diminishes. The leaves spoil quickly when removed from the plant, and lose their aroma when dried or frozen. The dry fruits are known as coriander seeds. The word "coriander" in food preparation may refer solely to these seeds (as a spice), rather than to the plant. The seeds have a lemony citrus flavour when crushed. It is described as warm, nutty, spicy, and orange-flavoured. Having a deeper, more intense flavor than the leaves, coriander roots are used in a variety of Asian cuisines, especially in Thai dishes such as soups or curry pastes. Coriander is commonly found both as whole dried seeds and in ground form. Roasting or heating the seeds in a dry pan heightens the flavour, aroma, and pungency. Ground coriander seed loses flavour quickly in storage and is best ground fresh. Roasted coriander seeds, called dhana dal, are eaten as a mouth refresher and digestive. They are the main spice in the south Indian dish sambhar. Outside of Asia, coriander seed is used widely in the process for pickling vegetables. In Germany and South Africa (see boerewors), the seeds are used while making sausages. In Russia and Central Europe, coriander seed is an occasional ingredient in rye bread (e.g. Borodinsky bread), as an alternative to caraway. The Zuni people of North America have adapted it into their cuisine, mixing the powdered seeds ground with chile and using it as a condiment with meat, and eating leaves as a salad. 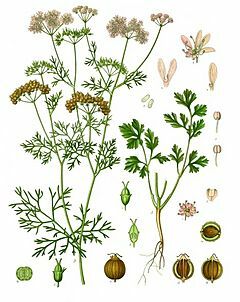 Coriander seeds are used in brewing certain styles of beer, particularly some Belgian Witbier. The coriander seeds are used with orange peel to add a citrus character. Coriander seed is one of the main traditional ingredients in the South African Boerewors, a popular spiced mixed-meat sausage. Different people may perceive the taste of coriander leaves differently. Those who enjoy it say it has a refreshing, lemony or lime-like flavor, while those who dislike it have a strong aversion to its taste and smell, characterizing it as soapy or rotten. 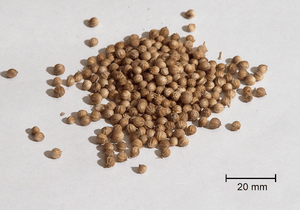 The nutritional profile of coriander seeds is different from the fresh stems or leaves. Leaves are particularly rich in vitamin A, vitamin C and vitamin K, with moderate content of dietary minerals (table). Although seeds generally have lower content of vitamins, they do provide significant amounts of dietary fiber, calcium, selenium, iron, magnesium and manganese. Coriander Facts for Kids. Kiddle Encyclopedia.